Several hours after her birth, Shatho was diagnosed with multiple developmental intestinal problems that would give her a lifetime of complications. Local physicians knew that treatment would involve very complicated surgery, but no local specialists were available. General Surgeon Dr. Georges Azzie of SickKids visits central Africa twice a year to provide medical care and specialized operations. 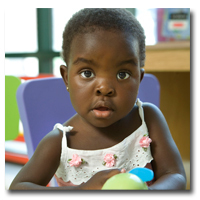 When he saw Shatho for the first time at two months of age, she was too small for an operation. He hoped he would be able to help her one day, but, on his return, determined that he did not have the right environment or team to perform the complicated surgery. Dr. Azzie consulted with urologist Dr. Pippi Salle and applied to Herbie Fund. Five months later, he called Shatho’s mother, Boswa, to inform her that Shatho had a Herbie sponsor. Herbie Fund pays for medical expenses in Canada, but Boswa and Shatho still needed travel money. During a Herbie Fund visit in April 2008, Citytv anchor Gord Martineau presented them with air tickets to Toronto. Shatho and her mother arrived in Canada, and further tests suggested that her abnormalities were more complicated than previously thought. In May 2008, Dr. Salle, Dr. Azzie and their teams proceeded with the seven-hour surgery. The operating team is very pleased with her post-op recovery and her prognosis. Shatho was at SickKids for a week, received follow-up treatment at the hospital until August, and will receive care at home in Botswana during Dr. Azzie’s semi-annual visits.